The Short Version: Greenville, South Carolina has become an attractive destination for couples planning a getaway. The city, with a population of around 70,000 people, offers plenty of romantic options, including dining, cultural experiences, and inviting green spaces. For couples who want to unwind, the city’s downtown is walkable, so they can leave the car parked while they enjoy a night on the town. Over the last decade, Greenville has invested heavily in revitalizing its central business district, helping the city stand out from other destinations in the region. A long weekend or vacation in Greenville, South Carolina can be appealing to all kinds of couples. Those interested in history may start by taking in the waterfalls at Falls Park, the birthplace of Greenville, in the center of the city. Nature lovers may spend an evening on a boating tour of Jocassee Lake. Foodies certainly won’t want to miss The Nose Dove, Greenville’s popular gastropub. Couples may take part in one of these activities, or they may want to do all three. In today’s Greenville, couples have plenty of options. That’s the beauty of the city, said Brenda Connell, a Public Relations representative on behalf of VisitGreenvilleSC. Greenville offers such a diverse set of activities because of its location and its size. The city is in the foothills of the Blue Ridge Mountains and maintains a unique cultural flair as it’s situated halfway between Charlotte, North Carolina, and Atlanta. The city’s size — approximately 70,000 people — gives it a large enough population to attract eateries, theaters, and other cultural experiences without sacrificing its small-town appeal. Couples can take in nature, history, and plenty of entertainment in Greenville, South Carolina. 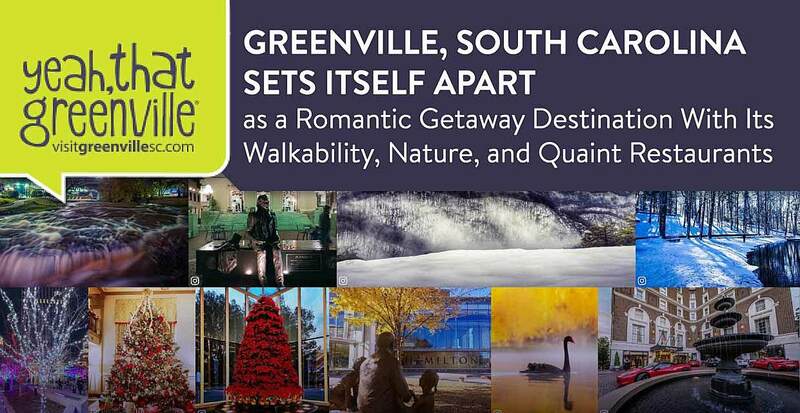 Brenda said many tourists seek Greenville out because it has four distinct seasons. In a typical year, Greenville can experience average low temperatures in the 30s and highs in the 80s. As part of South Carolina’s Upcountry, the city has maintained many traditions while also undergoing significant restoration. Over the last decade, Greenville has invested heavily in revitalizing its downtown area and restoring green spaces. Its efforts are paying off as visitors are flocking to the city — and bringing plenty of business with them. “We made these beautiful green spaces and invested in downtown. Now we’ve started getting attention from larger companies and restaurants,” Brenda said. Many couples plan vacations or excursions to reconnect with each other, but then they spend much of their time driving everywhere to experience what the city they’re visiting has to offer. Other couples prefer the ease of a car-free vacation. That’s one of the perks of a Greenville getaway, Brenda said. Couples don’t need to drive because everything in the city is walkable. “You don’t need a car for the entire weekend. If you plan some activities on the outskirts of town, you can easily call an Uber,” she said. This ease of getting around town is another reason Greenville is popular with tourists. The downtown and its surrounding areas were designed to be easy to navigate. “Downtown is so walkable. You’re just steps away from restaurants, outdoor activities, events, and the Peace Center which does Broadway musicals,” Brenda told us. Greenville hosts many of the city’s signature events downtown throughout the year. Artisphere, a three-day festival where patrons can meet artists who are both displaying and selling their wares, is held each May. Also in May is the festive Gallabrae, the Greenville Scottish Festival where kilts and bagpipes abound. In October, it’s Fall for Greenville, a three-day entertainment festival featuring fare from more than 40 local restaurants and music sounds from 70 groups. Though the city has invested a considerable amount in making its downtown area even more enjoyable, it isn’t finished. Next up is the addition of a large outdoor area next to downtown. “We are in the process of building another very large green space — slated to be called Unity Park — that will have an observation tower at its center,” Brenda said. 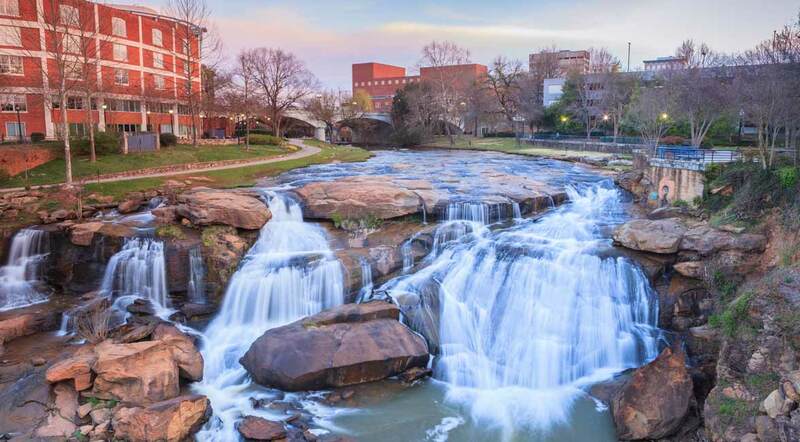 Located in Greenville’s downtown is one of the restoration project’s crowning achievements: the 32-acre Falls Park, where the city itself began. The city center is filled with trees, and the series of waterfalls for which the park is named. Because the park is in the heart of the city, many cultural events take place there as well. During the summer, Falls Park plays host to Greenville’s Shakespeare in the Park performances and regularly scheduled outdoor movies. Greenville’s 32-acre Falls Park hosts cultural events throughout the year. Outside of the city, couples can explore many more natural areas by foot, mountain bike, canoe, or kayak. One popular destination is Paris Mountain State Park, located just a 15-minute drive from downtown Greenville. Developed by the Civilian Conservation Corps during the Great Depression, the 1,540-acre state park offers several outdoor activities, including hiking, biking, and camping in a scenic green space. The 13-acre Lake Placid provides visitors with swimming and fishing opportunities. Bikers, walkers, and joggers also enjoy the GHS Swamp Rabbit Trail, a 22-mile mixed-use trail that connects Greenville with a small town called Travelers Rest. Hikers often enjoy stopping at the eateries that dot the trail. “Along the way, there are little stops and places to eat. And when you get to the end of the trail there are more shops, restaurants, and breweries,” Brenda said. Most of the trail’s users are mountain bikers who can reach Travelers Rest in a little over an hour. But that doesn’t mean visitors need to haul their bikes to Greenville for their vacation. Many shops around the city rent bikes so visitors can hop right on the trail. Greenville is becoming a popular romantic destination for couples because of its walkability, green spaces, and revitalized downtown. But they also come back for the date night dining. After all, Southern Living magazine called Greenville “a foodie paradise” thanks to its more than 120 locally owned restaurants. Brenda recommends dining at Jianna, a modern Italian restaurant and oyster bar. The restaurant serves house-made pasta, along with seafood and signature Italian cheeses. Many of its cocktails are inspired by the Negroni, traditionally made with gin, Campari, and sweet vermouth. During their visit, couples could take in a musical at the Peace Center, which brings in six touring Broadway productions every year. Other performers also make their way onto the Peace Center’s stage. In 2019, the Center welcomes well-known musicians including Sarah Mclachlan and Jerry Lee Lewis. Guests planning to visit in 2020 can look forward to a more luxurious Greenville experience at the Grand Bohemian Hotel, a seven-story boutique hotel that will break ground soon. The vintage-inspired hotel, located on the eastern side of Falls Park, will have 159 guest rooms — several of which will overlook the falls. Brenda said that Greenville has become an attractive tourist destination for couples thanks to its many diverse attractions and unique experiences. “Whether you’re outdoorsy or a foodie, Greenville has something for you. People are very proud to live here,” Brenda said.